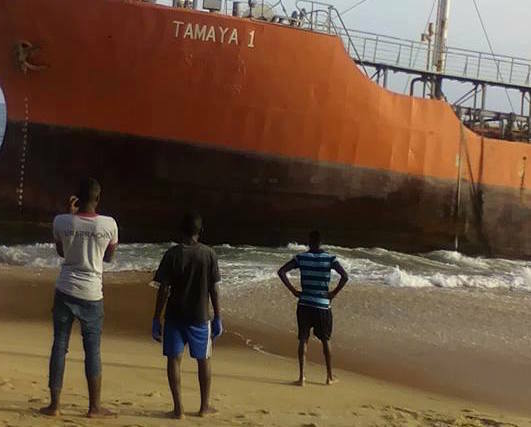 Liberian authorities have finally made comment about the Tamaya 1, a mysterious small product tanker that washed up on its shores last week with no crew onboard, and has since become quite a media sensation. Police were deployed to patrol the vessel, after it attracted huge interest from locals in the Robertsport area where it ran ashore six days ago. The Ministry of National Defense has now been onboard the 64 m long vessel and found much of the interior including the bridge and all documents were gutted by fire. One of the two liferafts that the ship has was missing, adding to speculation that the ship’s owner abandoned the old unprofitable ship. Adding to this theory, the tanker’s classification was withdrawn as it was overdue for a survey. Some local reports have claimed three men were seen taking off in a smaller vessel, possibly a liferaft, as the Tamaya 1 hit the shores. The vessel’s last AIS signal was from April 22, near Dakar.